You want to talk about a playmaker? Henderson is that and a bag of chips as the Buckeyes wing can pretty much do it all on the floor. The lefty can convert with either hand at the basket and athleticism sure isn't a worry with the 2019 star. Confidence follows a similar order as Henderson can find his shots without forcing and hit off the deck and off the catch from behind the arc. A stat line filler, Henderson must touch on his numbers at the foul line but with the elevated jumper that he already has in line, the future looks pretty impressive for the lefty wing. I dare you to find a better prospect within the 2020 ranks with as good of a floater game in the lane than Drake Dobbs. We would be doing a giant disservice here by not noting just how big of a fingerprint the lead guard leaves in each game that he competes in. He controls the floor like a savvy veteran, can score it from all three levels, and is capable of touching every corner of the stat sheet. Add it all up and what you have is a complete point guard from the Minnesota terrain. It's more about trying to find out what Doakes can't do rather than what he does do. The Arkansas native is as well rounded as your going to find at the off guard spot and is a pure bucket getter. His numbers on the scoreboard tack on like glue and his percentage numbers follow suit. He is efficient from all three levels within the half court and his athleticism and body control at the tin aren't too shabby either. One of the best young talents to make their way onto the floor here at Hopkins High this weekend, Doakes has star power written all over him. While it isn't too hard to spot Nobal Days out on the floor due to his length and size at this stage, the Butler Elite big man is more than just a big body. He is very mobile in running the floor and is comfortable facing the basket whenever things slow down. The Wisconsin native has continued to polish his jump shot and his footwork and agility around the tin is beyond good for just how long and young he is. With loads of potential and talent at his grasps, Days is someone to monitor and watch as he takes his talents to the high school ranks this fall. You don't have to be a rocket scientist to tell that King is a ballplayer. Whether it is on hard drives to the basket, quality dump offs to open teammates around the basket, or via the pull-up jumper, King had it all working on Sunday morning. In the close win over a pesky Barnstormers bunch, the Wisconsin native put it all together as he accounted for 14 points, eight boards, and seven steals, while just turning the ball over one time. King’s numbers and talent base display the makings of a star in the high school realm the next four years. Stanislav has made giant strides here in Minnesota over the past two days as the quality off guard has carried his team for stretches on the scoreboard. For as much of a lost art the mid range jumper is anymore, the Martin Brothers 8th grader doesn't want to hear much about that. He can hit off of a few dribbles within the confines of his team’s offense and picks his spots well without forcing. Although in defeat, Stanislav accounted for 27 points of his team’s 54 and is the prime candidate as the top stock booster here at the GNBA Championships. Martin plays for one of the most complete teams here at the GNBA Championships in the Milwaukee Spartans 14-under squad, yet he displayed star power on Sunday morning. Scoring 17 points in the win, Martin is a relentless aggressor on downhill drives to the basket and was able to attempt nine shots from the charity stripe. The cherry on top of the big W though was in his hammer dunk over an opposing defender that would make mixtapes with ease. Look for Martin and his Spartans bunch to continue their success this summer and beyond as the talent sure isn't lacking on this loaded team. While his stats don't tell the whole story, Hilmer is the guy that stirs the pot for his Iowa gang. He takes care of the ball in the backcourt and does a fine job of probing the defense whenever things slow down. More of a facilitator and distributor, Hilmer rarely ever forces the issue and with his decision making in line, usually finds the proper teammate to pass the rock to. 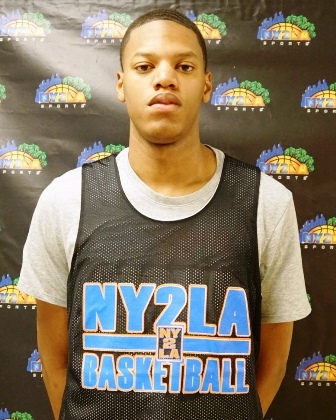 He can also hit on the outside jumper and is a good looking stock booster here in Minnesota. Watts is a ball of energy and is capable of helping his group in various ways. While heading into the finals weekend, the Net Gain product didn't boast the best of stat lines, yet what he did on Sunday showcased some different dimensions to his game. He scored the ball on run outs and pull up deep jumpers and had fine instincts in defending off the ball. With nice quickness and size to him, Watts put on a nice show in front of the the local crowd here in Minnesota. Krogman is a fine piece utilized by the Barnstormer squad as the big man competes within the trenches and is a nice option from 15-feet and in. He allows for spacing for his guards to attack the gaps and holes within the half court and can hit the mid range jumper. However, Krogman has impressive footwork and uses the pivot well on the upfake and step through along the baseline areas on the floor. Throw in the soft hook that he can hit over his right shoulder and there is a lot to like early on with the Iowa native down low. Scruggs is a smooth guard in the backcourt who does a commendable job of taking on primary ball handling duties where he probes the defense while barely ever turning the ball over. Entering the final weekend of play in the GNBA, Scruggs accounted for less than turnover per game, yet is capable of scoring on nice slices to the rim. He has solid body control off his feet and has the awareness to make the proper read and reaction. Looking the part, Scruggs is a keeper in the backcourt for the loaded Butler Elite young crop of ball players. You can tell immediately from the tip that Howell is a ballplayer. He brings a composed, savvy approach and the ability to find himself and his teammates open looks at the basket within the confines of his half court offense. Whether it is shooting it off the catch from deep, using the up fake appropriately near the tin, or distributing on the perimeter, there sure is a lot to like about the Yanders Law product in 2022. Gilbert controls the paint for his Barnstormers group due to his size and motor. He blocks shots around the basket and rebounds everything within his grasp in the lane. Gilbert gets out and runs the floor with a purpose and has a solid stat line to back up our viewing of him Sunday morning as he usually accounts for nine points and close to eight boards per game, where he also fairly never turns the ball ever whenever he receives the entry on the block. Holloman is one tough cookie as the wing for Minnesota Elite does a fine job of using his added length to get to the basket and score following the bump. With good size for his position on the floor, Holloman makes for a sturdy perimeter rebounder of the ball and because of it, can leave a dent in the stat sheet each time that he touches the floor, even when his jumper or layin attempts aren't finding their prescribed goal. With an effortless jumper and a fluidity to his game, Fahnestock is an entertaining scorer to watch out on the floor. With nice size and length to him and a quality feel for the game, the Pray & Play wing does a fine job of controlling the flow of the game and efficiently converting from the field. Heading into the final weekend of play, Fahnestock was making 63% of his two-point field goal attempts and on Sunday, the heady scorer only backed up the numbers with his solid scoring prowess that comes a lot easier to him compared to many others at his age level.